After spending a few days exploring Ha Long Bay and Cat Ba Island, we had to start moving our Vietnam trip south. 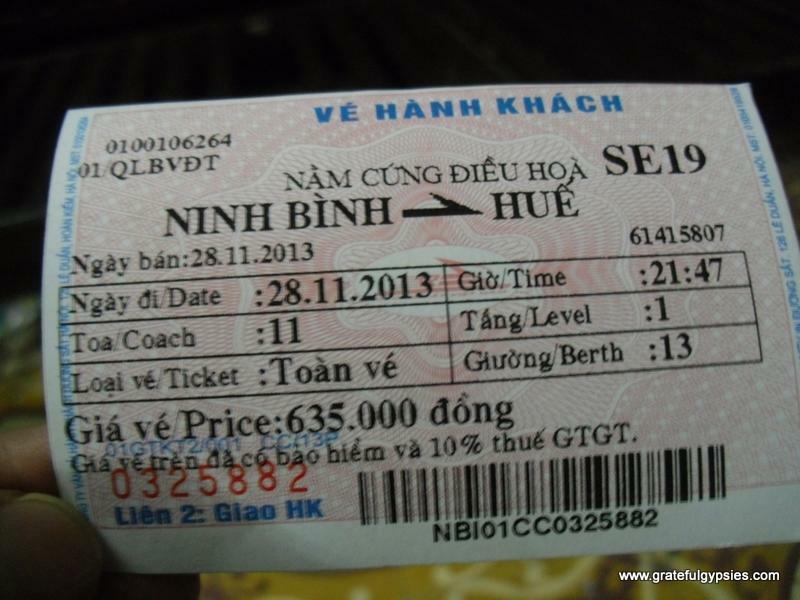 Not wanting to backtrack to Hanoi, we found that we could instead head to Ninh Binh first and catch a bus or train onward from there. 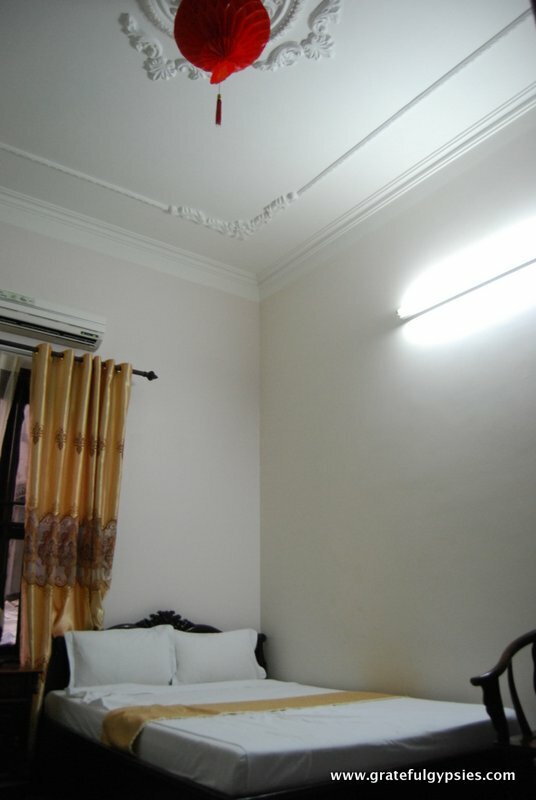 Home for a short one-night stay in Ninh Binh. From Cat Ba we took a bus, then a boat, and then another bus to get to yet another bus station where we were all crammed into a mini-bus. Traveling only by public transport in Vietnam can be quite the experience. The ride took about 3 hours including stops to pick up locals on the way. By the time we arrived in Ninh Binh, the mini-bus was packed to the brim, plus it was raining outside. Luckily for us, the owner of our guesthouse (who came recommended by the owner of our guest house on Cat Ba) met us with our name on a sign. He put us in a cab and even paid for it! We were given green tea and bananas upon arrival. VIP treatment at a two-star hotel in SE Asia – that’s how the Gypsies roll. Tired from our journey there we spent most of the evening relaxing at the guesthouse planning our one day there. After our delicious dinner of stir-fried beef and veggies, fried spring rolls, and tofu fried with tomatoes, we hit the sack. A tasty welcome meal in our hotel. 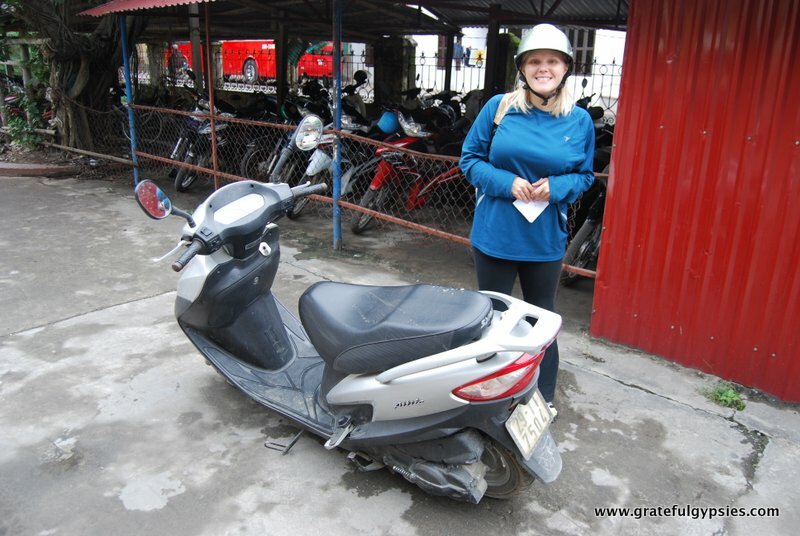 After breakfast, we rented a motor bike and headed out to see the sites. All we had was a copy of a poorly hand drawn map, so navigating the area was a little difficult. 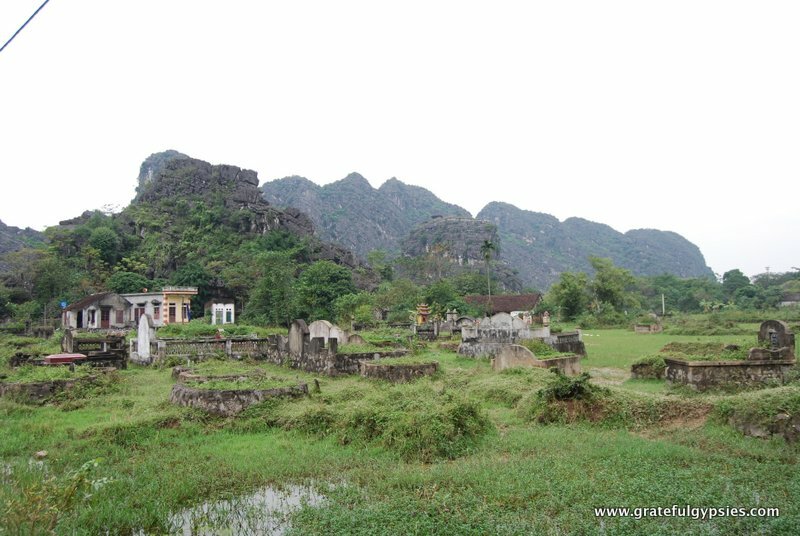 First we stopped at Hoa Lu Ancient Town, the capital of a Vietnamese kingdom in the 10th century. There are a few beautiful temples and tombs here, all surrounded by amazing scenery. Unfortunately there were also some large tour groups visiting at the same time as us. To get away from them, we wandered down a small road into a village where we saw a graveyard that looked like it could have been a rice field at some point. Or perhaps it was a functioning graveyard and rice field – people here are resourceful. Our ride in Ninh Binh. 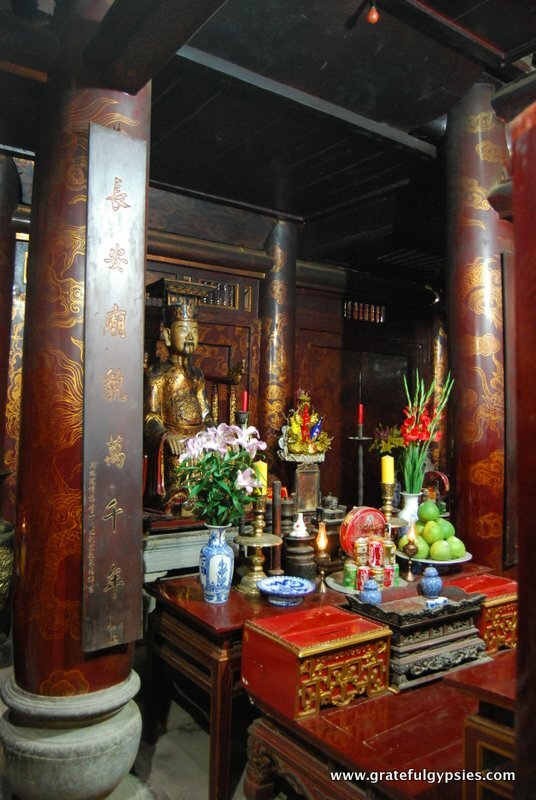 Inside one of Hoa Lu’s temples. Scenery around the temples out in the countryside. Back on the bike, we headed out in search of a pagoda, which we found, but not before getting lost on the way. When it finally came into view it looked as though it were under construction so we weren’t that enthusiastic about it. That, plus we were running low on gas and were out in the middle of the nowhere. 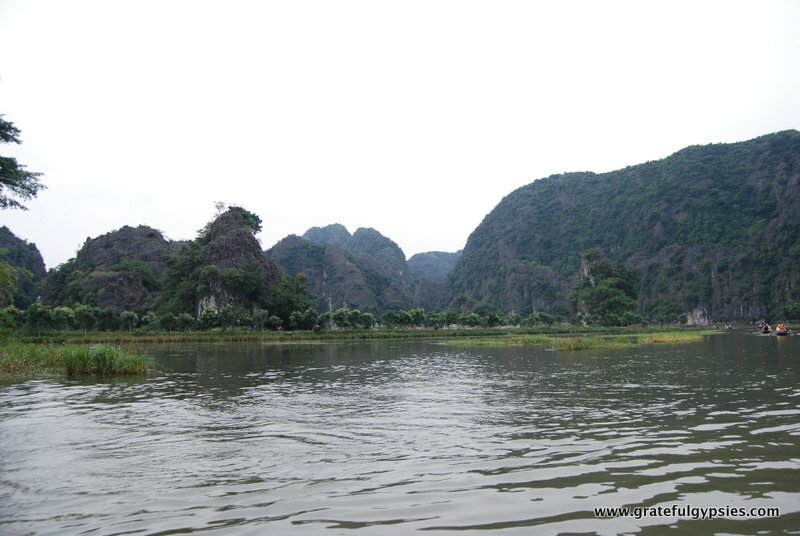 We decided to forgo it and head to the other side of the city for the main attraction, Tam Coc. Floating along the river in Tam Coc. 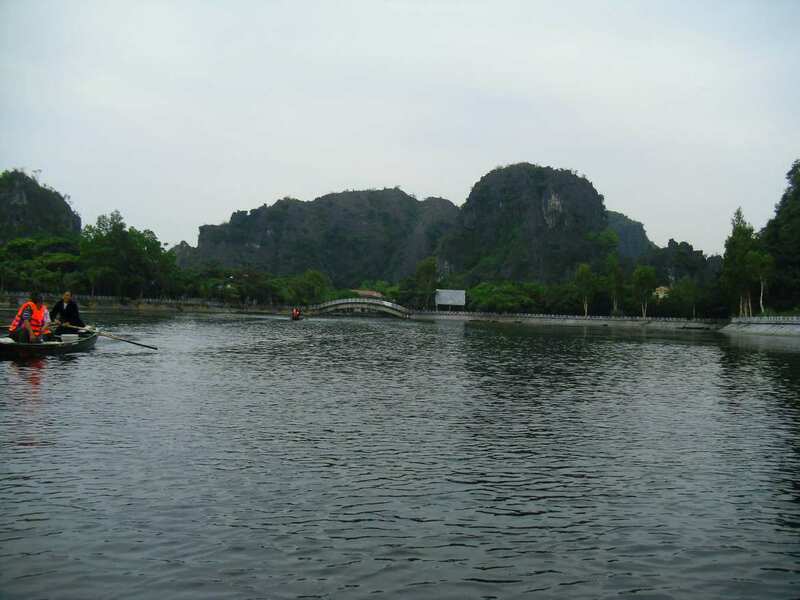 Tam Coc is a small village near Ninh Binh with a series of caves through a water way surrounded by tall limestone cliffs. There is a maximum of two people per boat so it’s just you and the rower – who can row with their feet. It was very interesting to watch and the scenery was amazing, even with the cloudy weather. Our rower pointed out wild goats walking all over the cliffs, and we passed by a local couple shooting their wedding photos. 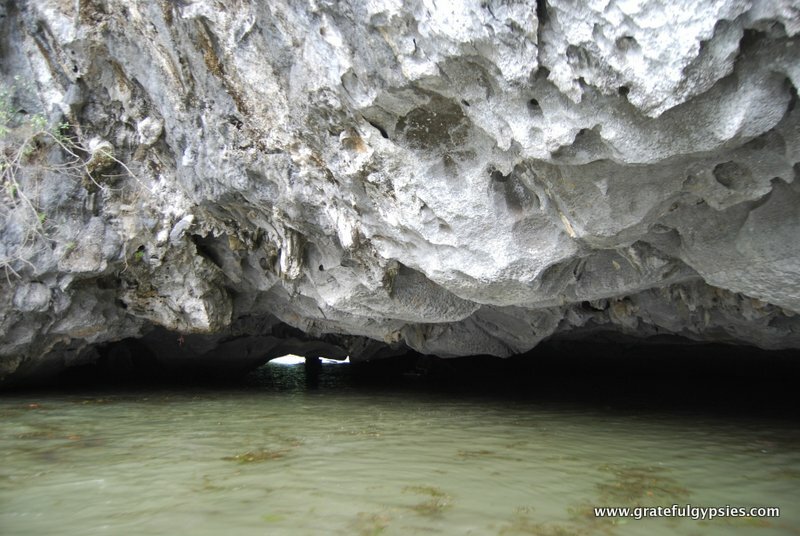 Heading into a cave while our rower steered the boat with his feet. Our final stop of the day was Bich Dong Pagoda. 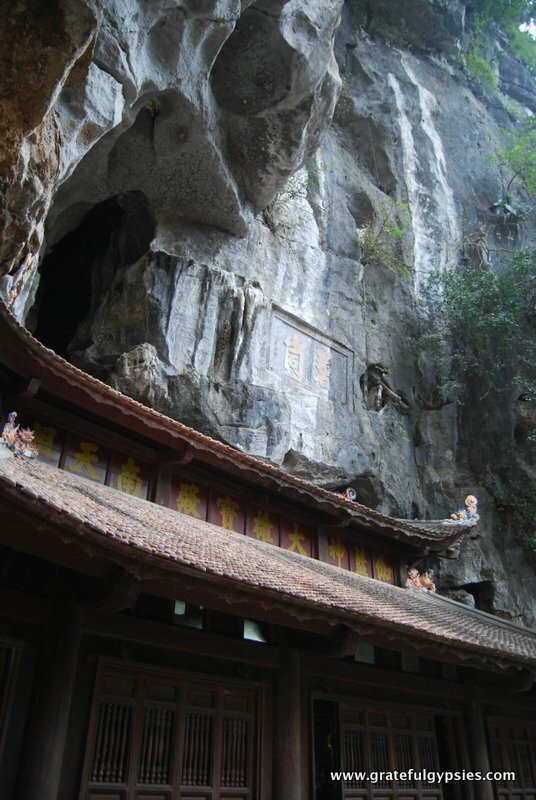 We climbed up to a mountain side cave temple that had a few smaller temples to visit along the way. It was a lovely, quiet place and a nice way to end our busy day. 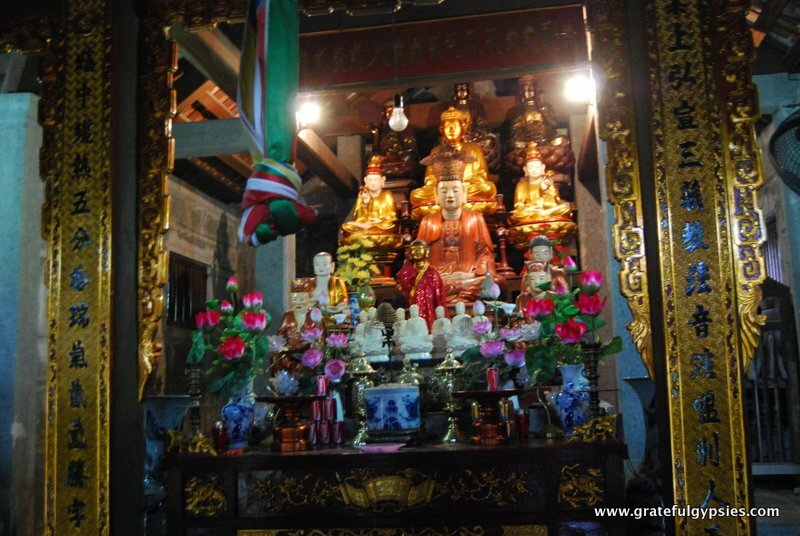 Buddhist shrine inside of the pagoda. 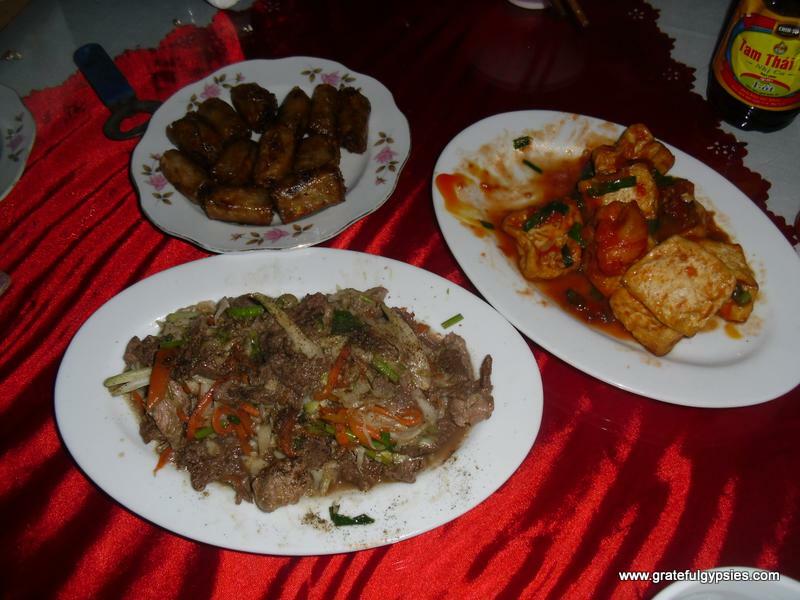 The three sights that we hit in Ninh Binh. This was also Thanksgiving Day in America. The tradition is to stuff yourself with turkey and watch football, but we had neither option available. 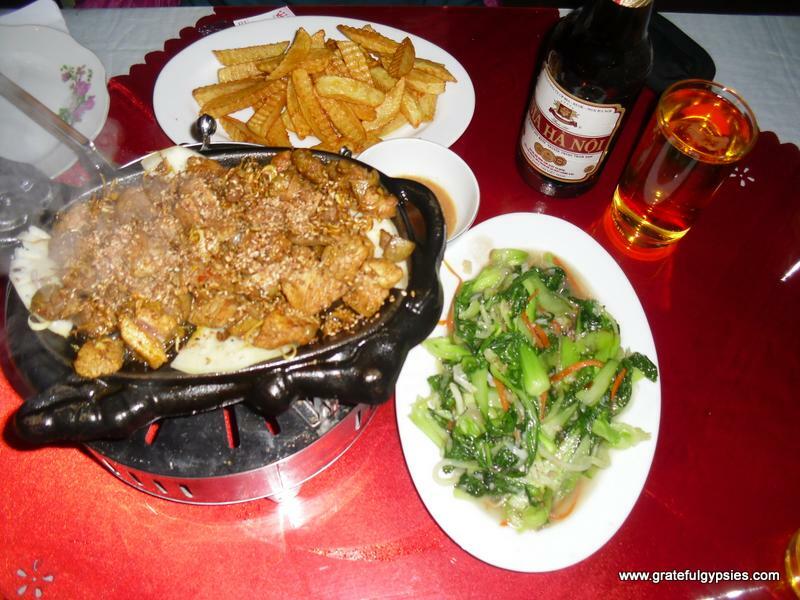 For our Vietnamese Thanksgiving, we decided to try the local specialty – goat meat. Actually, it wasn’t half baaaaad. We also had some morning glory and French fries for a nice American touch. It was certainly a different take on Thanksgiving dinner and we were both a bit homesick, but we’ve got a lot to be thankful about on this trip. Finally, the friendly guys working at our guesthouse took us to the train station on their motorbikes where we boarded our over night train for Hue. 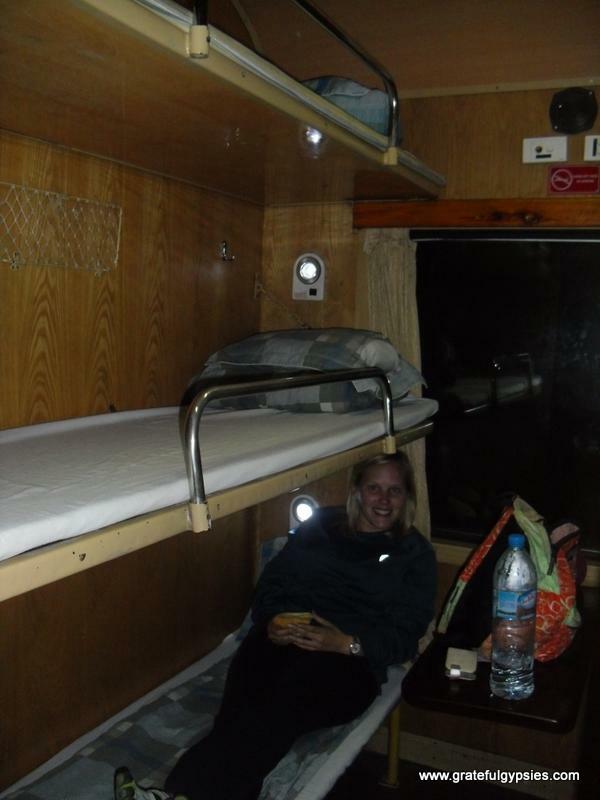 We had hard sleeper tickets and we managed to get the whole 6-bunk room to ourselves. We stayed up drinking beers and watching TV until we were tired enough to sleep, without disturbing anyone. Well, we did attract the attention of one Vietnamese guy. He heard us watching American TV and came in our room to check out some “How I Met Your Mother” and touch Sasha’s beard. He hung out for a good 10-15 minutes, didn’t speak a word of English, and just left. These are the hilarious moments that you come to appreciate when traveling. With only one day to spend in Hue and the rain pouring down, it was another interesting quick stop on our quickly moving journey through Vietnam. More on that and the rest of our long, strange tour through SE Asia is on the way in the weeks to come. Next stop – another ancient capital in Hue. love your travel blog and pics – my only suggestion would be to make the photo captions a different font size – i am having trouble reading them! !